WASHINGTON, DC, November 9, 2012 (ENS) – South Korean automakers Hyundai and Kia exaggerated the fuel economy estimates for the majority of their 2012 and 2013 vehicles offered for sale in the United States and must re-label the vehicles and reimburse owners. The discrepancy was uncovered by the U.S. Environmental Protection Agency, acting on consumer complaints about Hyundai and Kia vehicles. In the past, the EPA’s audit testing has occasionally uncovered individual vehicles with incorrect label values and required the manufacturer to re-label the vehicle. This has happened twice since 2000. But the agency says this is the first time that a large number of vehicles from the same manufacturer have deviated so widely from their stated fuel economy values. Cars currently on dealer lots will be re-labeled by the sister auto companies with new window stickers reflecting the corrected mileage estimates. The mileage on most vehicle labels will be reduced by one to two miles per gallon. 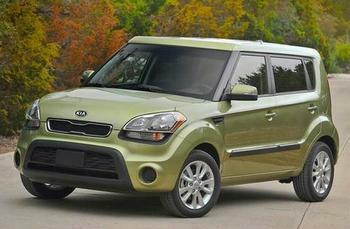 The largest adjustment will be six mpg highway for the 2012 and the 2013 Kia Soul. The Korean automakers, which share components and testing, blamed “procedural errors” at joint testing operations in Korea. “I sincerely apologize to all affected Hyundai and Kia customers, and I regret these errors occurred,” said Dr. W.C. Yang, chief technology officer of Hyundai/Kia research and development. To reimburse the extra money car owners are paying for fuel, Hyundai and Kia have agreed to issue owners special debit cards in a court-approved settlement estimated to be worth between $75 million and $125 million. But that remedy does not satisfy 23 Hyundai and Kia owners, who are seeking $775 million in damages in a class-action lawsuit filed this week against the two automakers in the U.S. District Court for Central California. The class action complaint alleges that Hyundai and Kia were able to sell more vehicles and charge more per vehicle because of the deceptive advertising. The lawsuit has not yet been granted official class-action status. This is the third lawsuit facing Hyundai and Kia for the inaccurate fuel-efficiency claims. Another lawsuit was filed in Ohio earlier this week on behalf of three plaintiffs: one Ohio resident who purchased a 2012 Kia Rio, and a Canadian couple who own a 2013 Hyundai Elantra. That lawsuit asks for $5 million in damages but does not seek class-action status. The first lawsuit was filed in July by the California-based consumer group Consumer Watchdog. It seeks unspecified damages on behalf of one Hyundai Elantra owner in Sacramento, California. This entire situation began when Jamie Court of Consumer Watchdog wrote a letter to President Barack Obama calling for an audit of inflated mile per gallon claims for the Hyundai Elantra. “Consumers are largely unaware – and would be shocked to know – that the Environmental Protection Agency does not conduct most auto clean air and MPG tests. Manufacturers conduct the tests themselves and transmit the results to the EPA, with a low likelihood that the EPA will re-test to confirm validity,” wrote Court. The Consumer Watchdog lawsuit does seek class-action status, but the court has not yet granted it. The EPA is updating its fuel economy site, www.fueleconomy.gov to reflect the Hyundai and Kia corrected numbers.